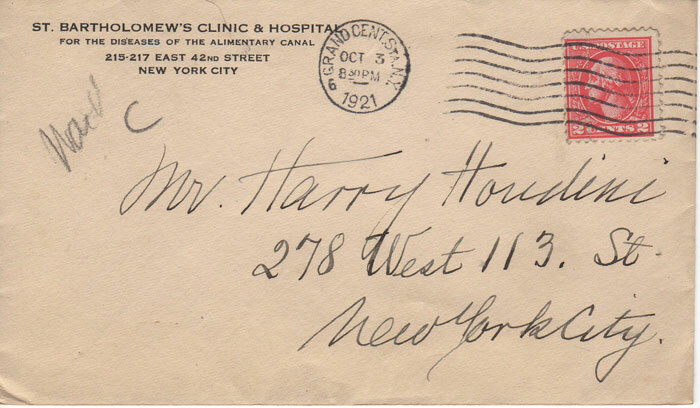 Envelope found in Houdini's desk - from a NY hospital! Touched by the hand of Houdini! Just think- you can own a piece of magical history- something that was handled by the great Harry Houdini himself! See a larger version of the image. In the late 1980's, magician Peter Monticup (owner of MagicTricks.com), purchased Harry Houdini's ornate desk. Peter purchased the desk from this buyer, along with a number of personal items from the Houdini home. 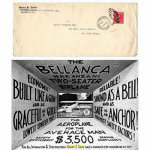 Houdini was a notorious "saver", so it is no surprise that he kept these envelopes. The letters were from all different sources- his lawyers, his fans, fellow magicians, etc. In researching the envelopes, we've found an important connection to an event or person in Houdini's life. This is one of the envelopes found in the desk. It is postmarked October 3, 1921 from Grand Central Station, NY. 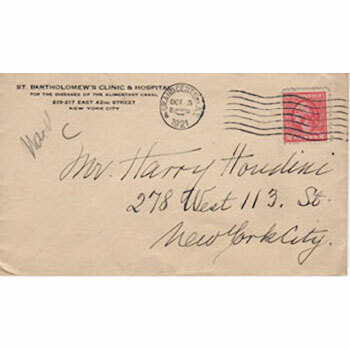 The return address is from St. Bartholomew's Clinic and Hospital for the Diseases of the Alimentary Canal, 215-217 East 42nd Street, New York City. Though mainly a hospital for the treatment of digestive diseases, St. Bartholomew's provided key research for a controversial study published in 1920. Titled Intestinal Pathology in the Functional Psychoses, the study claimed to find a connection between poor dietary health and mental illness. The theory was that insanity could be treated by targeting and treating intestinal infection. Houdini was a passionate proponent of physical fitness, and would have been keenly interested in this topic. 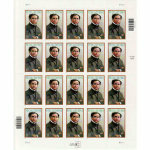 This is a standard size envelope (about 3.5" x 6"). It's old, it's been through the mail, it's yellowed. Someone (Houdini?) tore it across the top (probably with a dull letter opener) to remove the contents. Buy this item - get 75 Rewards Points!